Created in the DW Custom Shop, the New Yorker drums were designed in compact sizes for easier portability. An 8”x10” mounted tom, 12”x13” floor tom, 14”x18” bass drum and 6”x13” snare. 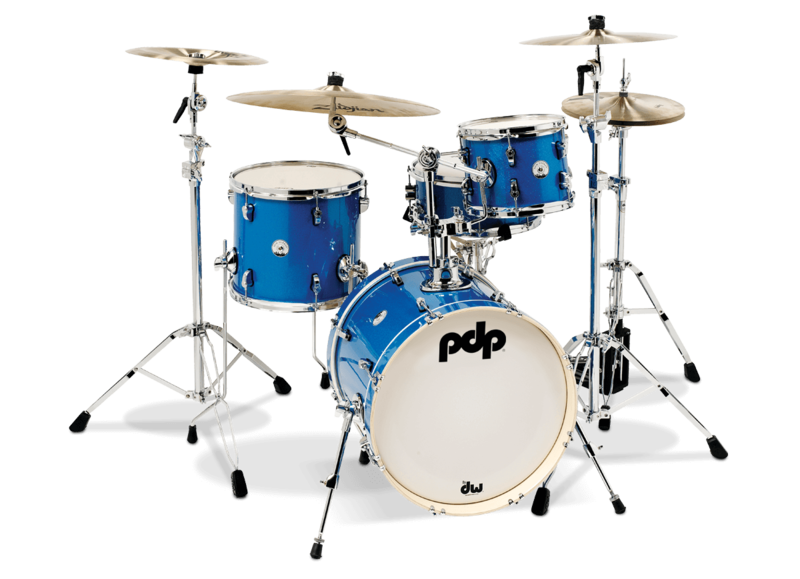 And now, the New Yorkers are available from PDP in stylish kits for the student or working drummer, in brilliant Diamond or Sapphire finishes. PDP New Yorker Kits exhibit warm, full tones, courtesy of their all-poplar shells. The low-mass, Teardrop Mini-Turret lugs help to make them lightweight and travel-friendly. But reduced weight doesn’t mean fewer features! The New Yorker Kits still include DW’s innovative True-Pitch tension rods, world-class drum heads from Remo, and a versatile bass drum mount that combines a tom arm with an auxiliary clamp. Each kit even includes a bass drum lifter to accommodate almost any variety of bass drum pedal. For drummers on the move, PDP New Yorker Kits are the perfect choice.